Israeli Prime Minister Ariel Sharon has long been a champion of the Jewish settler cause. Now he has proposed pulling out of most or all of Gaza and parts of the West Bank. BBC News Online examines the background to the issue. There are about 240,000 settlers in the West Bank, populating some 120 fully fledged settlements and dozens of "outposts". These are little more than mobile homes or prefabricated buildings on isolated hilltops. Huge Jewish blocks split the West Bank into isolated Palestinian land, and a number of key settlements would have to be abandoned to make way for a viable, contiguous Palestinian state. At the moment, the massive Ariel settlement to the north, the Jerusalem settlements - where a further 160,000 settlers live - and those around Hebron would divide a Palestinian state into three separate areas or "cantons". According to reports, the Israelis have earmarked 17 settlements which would have to be dismantled. But the Palestinians say the number must be higher. In May, Khalil Shikaki, head of the Palestinian Centre for Policy and Survey Research identified 34 settlements that would have to be removed to establish contiguity. This would affect an estimated 13,000 to 14,000 settlers. The continued building of Jewish homes in the West Bank is a major obstacle to a renewed peace process. 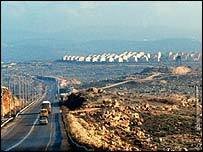 According to the Israeli human rights group, Peace Now, some 60 outposts, some of them uninhabited, have been established since Mr Sharon came to power. So far, Mr Sharon has said he will dismantle some settlements that are seen as illegal under Israeli law - this will apply mostly to such outposts. Jewish settlements, themselves, contravene international humanitarian law, which prohibits an occupying power transferring citizens from its own territory to occupied territory. (This is laid down in the Fourth Geneva Convention, article 49). According to the Israeli human rights group B'tselem, Israeli governments over the past 20 years have used a complex legal and bureaucratic mechanism to take control of more than 50% of the land in the West Bank. This has been used to either establish settlements or create reserves of land for future settlement expansion. There are two main types of settler - secular, economic migrants and those motivated by religious and nationalistic causes. The largest settlements are populated by migrants in search of a better lifestyle than they can afford in the large Israeli cities, such as Tel Aviv. Tens of thousands are immigrants from the Soviet Union. Many have taken advantage of the subsidies offered by the government for home purchases. Many Jews, however, have settled on the land for religious reasons, describing themselves as "pioneers" claiming the biblical heartland of Judea and Samaria. They portray themselves as standard-bearers of Judaism and Zionism against a secular Israel that has lost its way. These religious and nationalist zealots do not command much sympathy among Israelis. Palestinian militant groups have declared settlers legitimate targets in their war against occupation, and have singled them out for attack with increasing regularity. For their part, some settlers have responded with attacks against Arabs and their property. The Palestinian militants argue that because the settlements are illegal and many settlers belong to Israel's security forces, settlers are not entitled to the protections granted to civilians by international law. This argument, however, is refuted by B'tselem, who say that the illegality of settlements has no effect on the status of their civilian residents. The settlement project began after the Arab-Israeli war of 1967, when Israel seized the West Bank and Gaza territories from Jordan and Egypt. The Gush Emunim (Bloc of the Faithful) inspired religious nationalists to found the settlements. The activity during the 1970s was largely led by Mr Sharon who was then a government minister. Since the 1993 Oslo peace accords, the number of Jewish settlers has increased by 70% - from 125,000 to 200,000 - not counting the 200,000 Israelis living in 11 settler quarters in East Jerusalem, according to official figures. 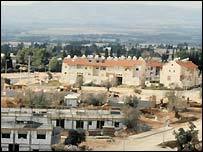 A number of settlements have been built very close to refugee camps, where Palestinians live cheek-by-jowl in squalor. Many are protected by security guards and Israeli troops are often stationed nearby. In some cases, settlers and their children are forced to enter and leave the settlement in armoured military trucks escorted by soldiers. But some Israelis question now whether the enclaves are worth defending.